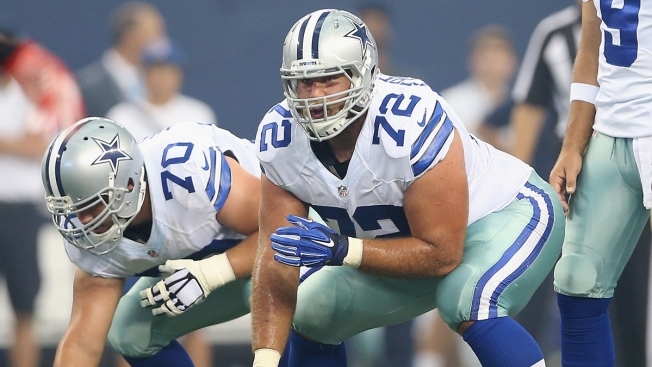 The Dallas Cowboys picked up their fifth-year option on guard Zack Martin Tuesday. The Cowboys officially exercised their team option for the 2018 season on Martin's rookie contract, according to the NFL Network's Ian Rapoport, which team executive vice president Stephen Jones said was a top priority in January. Since being picked 16th overall by Dallas in the 2014 NFL Draft, Martin has been one of the better offensive lineman in football. He's been named to the All-Pro team in each of his three seasons, first-team twice and second-team once. The 26-year-old Martin should earn about $9.3 million in 2018, according to Rapoport. The move ensures all three of the Cowboys' first-round offensive linemen — Martin, offensive tackle Tyron Smith and center Travis Frederick — will be with the team for at least two more seasons. Smith and Frederick signed long-term extensions shortly after the Cowboys picked up their team options in 2014 and 2016, respectively.